Chris Arnold, David Martin and Geoff Morrow were prolific British pop song writers from the mid 1960s to the mid 1980s, having their songs performed by artists as diverse as Cilla Black, Barry Mannilow, The Carpenters, and Bruce Forsyth. 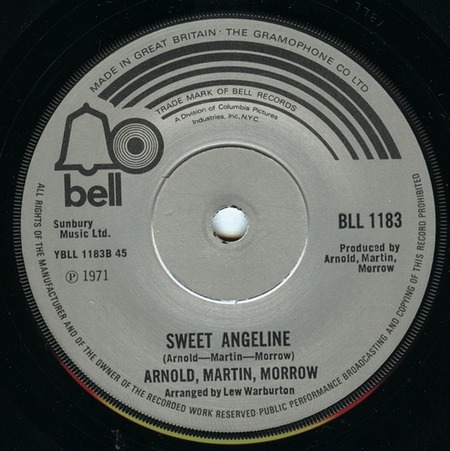 They also recorded a few numbers themselves, one of which was their own "Sweet Angeline," released in late 1971 on the Bell label, number BLL 1183. Elvis recorded several other Arnold, Martin, and Morrow compositions: "Just A Little Bit Of Green," "This Is The Story," "Let's Be Friends" and "Change Of Habit."